The domain within your query sequence starts at position 49 and ends at position 117; the E-value for the IB domain shown below is 6.39e-13. 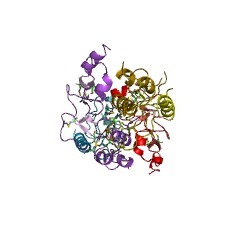 High affinity binding partners of insulin-like growth factors. All IGFBPs share a common domain architecture (IPR000867:IPR000716). 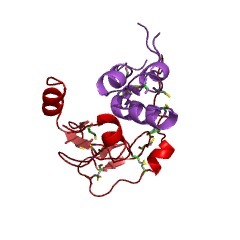 While the N-terminal (IPR000867, IGF binding protein domain), and the C-terminal (IPR000716, thyroglobulin type-1 repeat) domains are conserved across vertebrate species, the mid-region is highly variable with respect to protease cleavage sites and phosphorylation and glycosylation sites. 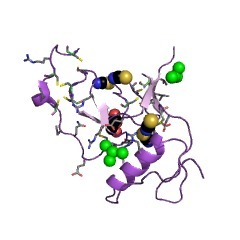 IGFBPs contain 16-18 conserved cysteines located in the N-terminal and the C-terminal regions, which form 8-9 disulphide bonds [(PUBMED:11874691)]. 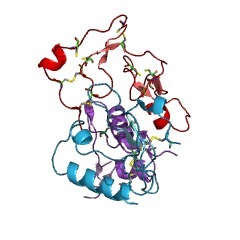 As demonstrated for human IGFBP-5, the N terminus is the primary binding site for IGF. This region, comprised of Val49, Tyr50, Pro62 and Lys68-Leu75, forms a hydrophobic patch on the surface of the protein [(PUBMED:9822601)]. The C terminus is also required for high affinity IGF binding, as well as for binding to the extracellular matrix [(PUBMED:9725901)] and for nuclear translocation [(PUBMED:7519375), (PUBMED:9660801)] of IGFBP-3 and -5. IGFBPs are unusually pleiotropic molecules. Like other binding proteins, IGFBP can prolong the half-life of IGFs via high affinity binding of the ligands. In addition to functioning as simple carrier proteins, serum IGFBPs also serve to regulate the endocrine and paracrine/autocrine actions of IGF by modulating the IGF available to bind to signalling IGF-I receptors [(PUBMED:12379487), (PUBMED:12379489)]. Furthermore, IGFBPs can function as growth modulators independent of IGFs. For example, IGFBP-5 stimulates markers of bone formation in osteoblasts lacking functional IGFs [(PUBMED:11874691)]. The binding of IGFBP to its putative receptor on the cell membrane may stimulate the signalling pathway independent of an IGF receptor, to mediate the effects of IGFBPs in certain target cell types. 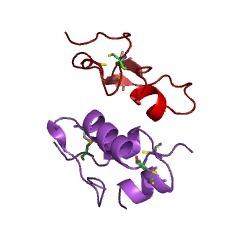 IGFBP-1 and -2, but not other IGFBPs, contain a C-terminal Arg-Gly-Asp integrin-binding motif. Thus, IGFBP-1 can also stimulate cell migration of CHO and human trophoblast cells through an action mediated by alpha 5 beta 1 integrin [(PUBMED:7504269)]. Finally, IGFBPs transported into the nucleus (via the nuclear localisation signal) may also exert IGF-independent effects by transcriptional activation of genes. 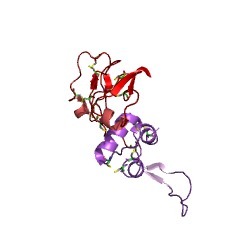 This entry represents insulin-like growth factors (IGF-I and IGF-II), which bind to specific binding proteins in extracellular fluids with high affinity [(PUBMED:7680510), (PUBMED:1725860), (PUBMED:2480830)]. 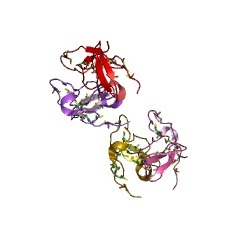 These IGF-binding proteins (IGFBP) prolong the half-life of the IGFs and have been shown to either inhibit or stimulate the growth promoting effects of the IGFs on cells culture. They seem to alter the interaction of IGFs with their cell surface receptors. There are at least six different IGFBPs and they are structurally related. The following growth-factor inducible proteins are structurally related to IGFBPs and could function as growth-factor binding proteins [(PUBMED:1654338), (PUBMED:1309586)], mouse protein cyr61 and its probable chicken homolog, protein CEF-10; human connective tissue growth factor (CTGF) and its mouse homolog, protein FISP-12; and vertebrate protein NOV. There are 5647 IB domains in 5643 proteins in SMART's nrdb database. Taxonomic distribution of proteins containing IB domain. This tree includes only several representative species. The complete taxonomic breakdown of all proteins with IB domain is also avaliable. Click on the protein counts, or double click on taxonomic names to display all proteins containing IB domain in the selected taxonomic class. IGF binding proteins and their functions. Characterization of insulin-like growth factor (IGF) binding proteins and their role in modulating IGF-I action in BHK cells. We have found that over one-half of the total cell surface 125I-insulin-like growth factor I (IGF-I) binding to BHK cells represents binding to IGF binding proteins (IGFBPs) rather than to the IGF-I receptor. In addition to a number of secreted IGFBPs, we have now characterized two cell-associated IGFBPs with unique characteristics. The cell-associated IGFBPs have molecular weights of 30,000 (30K) and 25,000 (25K), as determined by the Western ligand blot technique. 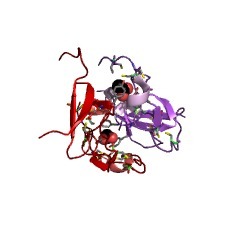 IGFBP-30K is located at the cell surface and can be readily labeled by affinity cross-linking with 125I-IGF-I. Surface expression of IGFBP-30K increases 5.4 +/- 1.2-fold (n = 11) with serum starvation. This induction is fully evident by 4 h, plateauing by 24 h, and is completely inhibitable by cycloheximide. The fasting-induced increase in IGFBP-30K is inhibited by IGF-I and by des-IGF-I and, to a lesser extent, by insulin. Unlike cell-associated IGFBP-30K, secretion of IGFBP was stimulated (6.8 +/- 0.5-fold, n = 2) by IGF-I, whereas IGFBP secretion was inhibited 54% by insulin. These results demonstrate coordinate regulation of IGFBP by serum starvation and IGF-I, such that at low concentrations of IGF-I, cell surface binding protein increases whereas binding protein secretion decreases. At high concentrations of IGF-I, IGFBP secretion increases and cell surface IGF-I receptor, as well as IGFBP, decreases. Taken together, these regulatory events regulate the availability of IGF-I for biologic signalling. Classification of the insulin-like growth factor binding proteins into three distinct categories according to their binding specificities. 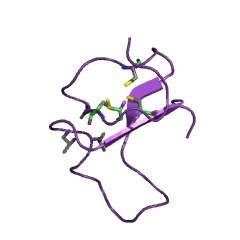 Competitive binding experiments with insulin-like growth factor (IGF)-1, IGF-2 and des-(1-3)-IGF-1 have confirmed the interpretation based on limited amino-terminal sequence analysis that at least three types of IGF binding protein occur. In addition to the acid stable subunit of the large serum binding protein which exhibits des-(1-3)-IGF-1 binding only slightly less than IGF-1, the small IGF binding proteins can be separated into two classes based on differences in des-(1-3)-IGF-1 and IGF-2 binding potencies. This information is based on mapping of SMART genomic protein database to KEGG orthologous groups. Percentage points are related to the number of proteins with IB domain which could be assigned to a KEGG orthologous group, and not all proteins containing IB domain. Please note that proteins can be included in multiple pathways, ie. the numbers above will not always add up to 100%.